BEHOLD, TRUE BELIEVERS! 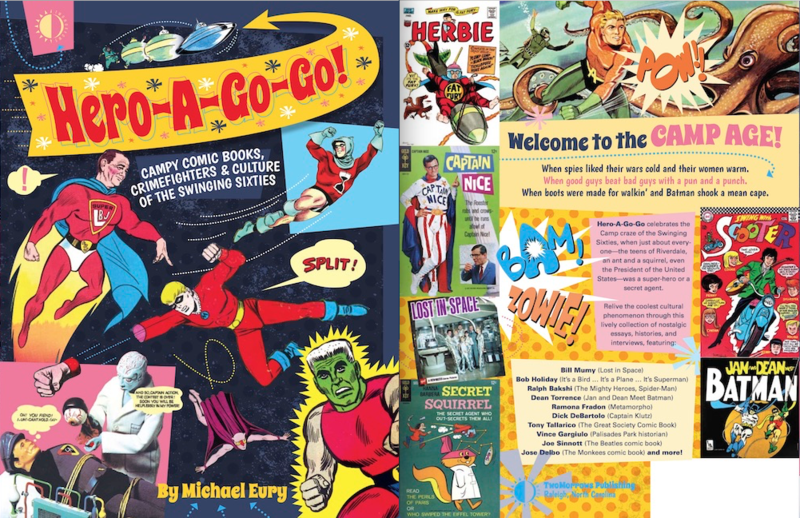 Your Guide to the MARVEL Cartoons of the ’60s! Home » COMICS HISTORY » BEHOLD, TRUE BELIEVERS! Your Guide to the MARVEL Cartoons of the ’60s! No exploration of ’60s pop culture would be complete without a healthy look at Saturday morning cartoons. Hero-A-Go-Go! rightly spends a lot of real estate on this area, including substantial segments on Hanna-Barbera, Filmation and much more. For this excerpt, I’ve chosen to focus on the Marvel animation of the time mainly because the 1967 Spider-Man show just may be my favorite cartoon of all time. By the way, if you’re into Filmation — and why wouldn’t you be — you oughta check out what we’ve got going on over here. The first Marvel project from Krantz Films was Marvel Super-Heroes in 1966, with production by Grantray-Lawrence Animation, a company formed in 1954 by Bob Lawrence and animators Grant Simmons and Ray Patterson. Grantray-Lawrence employed a technique called Xerography for the animation, taking actual images from Marvel Comics original artwork and adapting them into cels. While the animation itself was severely (and at times laughably) limited, it made the cartoons true to form—they were literally Marvel Comics come to life. Having the cartoons cheaply produced but widely distributed generated huge profits for Krantz Films. 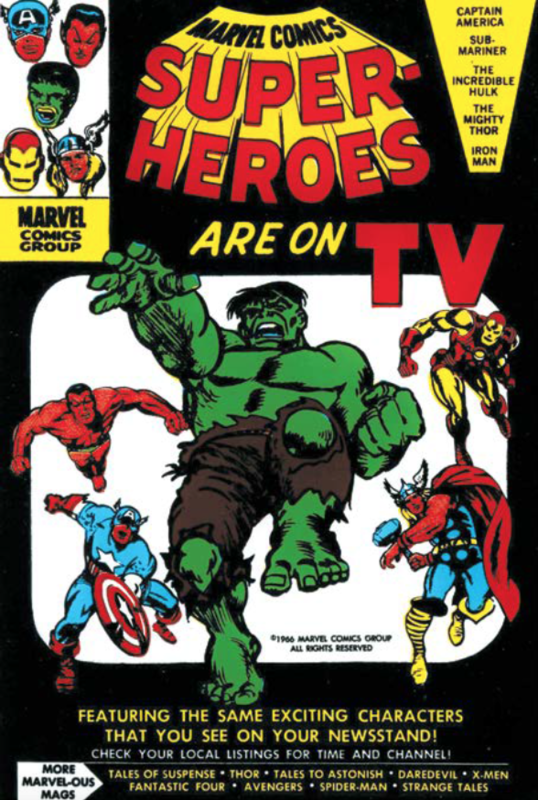 Premiering in syndication on September 1, 1966, Marvel Super-Heroes presented the adventures of one Marvel character per day of the week, for a total of 13 three-chapter episodes for each: Captain America on Monday, Hulk on Tuesday, Iron Man on Wednesday, Thor (appropriately) on Thursday, and Sub-Mariner on Friday. These cartoons provided Marvel fans with their first opportunity to hear their heroes speak. Voicing Captain America was Sandy Becker, a popular New York City children’s television show host. Voicing Iron Man and Sub-Mariner was actor John Vernon, perhaps best known for his role as the double-secret-probation-threatening Dean Wormer in 1978’s National Lampoon’s Animal House; the Hulk was voiced by Canadian radio show host Max Ferguson; and Thor was handled by Canadian actor Chris Wiggins. The Marvel Super-Heroes episodes were directed by Patterson, Simmons, Don Lusk and Sid Marcus. June Patterson headed up the “Story Adaptations,” the addition of talking lips and limited movement to the comic-book art. While there was limited money for Marvel Comics from the distribution of these cartoons, the de facto storyboard artists—Gene Colan, Steve Ditko, Don Heck, and Jack Kirby, who had drawn the comic books adapted into animation—received an acknowledgment on an end-credits title but no financial compensation. What is best remembered about these cartoons is their theme music, silly little jingles that succinctly established the backstories and personalities of each character—in a matter of twenty or so sing-along seconds. “I wish I could claim to have written the [theme song] lyrics, because I think they’re brilliant,” Stan Lee admitted to interviewer Adam McGovern in The Jack Kirby Collector #47 (Fall 2004). According to the cartoons’ end credits, “original music and lyrics” were by Jacques Urbont. Steve Krantz’s original presentation for Marvel Super-Heroes included the Amazing Spider-Man, until he realized Spidey’s potential and withheld him as a solo property. That potential was realized at 10:00 a.m. Eastern Time on September 9, 1967, when Spider-Man premiered as part of ABC’s Saturday morning line-up, its “does whatever a spider can” theme song by Bob Harris and Paul Francis Webster quickly becoming a pop-culture anthem. Spidey’s costume was simplified for animation (underarm webbing? I don’t think so! ), and reused footage was common, particularly Spider-Man’s web-swinging across the city, with Ray Ellis’ dramatic score diverting the viewer’s attention from noticing the sameness of the shots. The hero’s cast was streamlined for Season One’s adventures, mainly focusing on Peter Parker’s work life at the Daily Bugle and his battles with supervillains, some translated from the comics (including Dr. Octopus, the Rhino, and the Vulture), others created for the show (such as the Fantastic Fakir and Dr. Noah Boddy). Story and art consultants were none other than “Smilin’” Stan Lee and “Jazzy” Johnny Romita. Voice actors included Paul Soles as Peter Parker/Spider-Man, Paul Kligman as the crusty J. Jonah Jameson, and Peg Dixon as Betty Brant. Spider-Man was a hit, but with Season Two a dramatic change occurred. Grantray-Lawrence was gone, with Steve Krantz’s Krantz Films taking over production. According to Ralph Baskhi, whom Krantz hired to helm the program, Krantz slashed the show’s budget to bare bones in order to maximize its profit. Bakshi’s limited budget forced the removal of most of the Marvel villains and supporting cast, with generic threats and aliens added for Spidey to fight. More footage was recycled—even some from Rocket Robin Hood—and the show took on a darker palette. 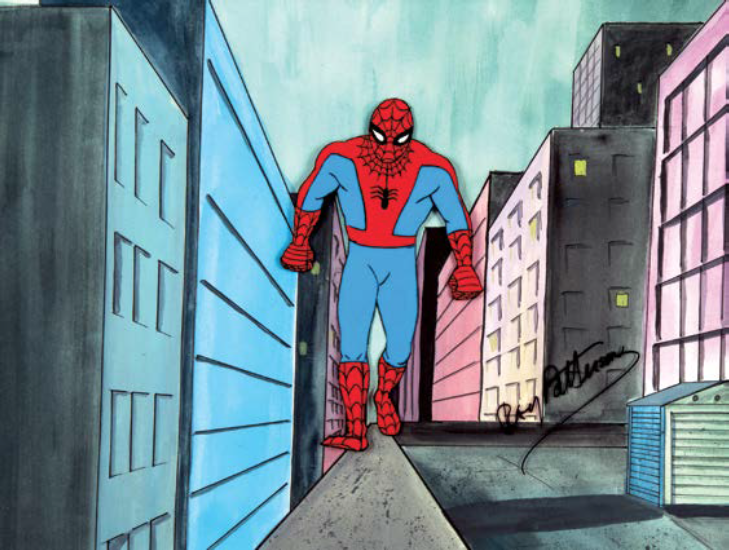 With 52 episodes under its belt, Spider-Man ended its run on June 14, 1970, but became a longtime staple of afternoon syndication. Premiering a half-hour before Spider-Man on Saturday, September 9, 1967 was Marvel’s other Camp Age super-hero cartoon, The Fantastic Four. This series, produced and directed by Bill Hanna and Joe Barbera, adapted many of Stan Lee and Jack Kirby’s stories into episodes, with their characters reinterpreted for television by the astounding Alex Toth. Voicing the characters were cartoon stalwart Paul Frees as the Thing, durable screen and TV actor Gerald Mohr as Mr. Fantastic, winsome television and film actress Jo Ann Pflug as the Invisible Girl, and Jack Flounders as the Human Torch. Many of Hanna-Barbera’s go-to voice performers played FF foes and friends, including Ted Cassidy as Galactus, Janet Waldo as Lady Dorma, Vic Perrin as the Red Ghost and the Silver Surfer, and Hal Smith as Klaw. The show’s 20 episodes ran on Saturday mornings for three seasons before being squeezed off the air by a wave of anti-violence advocacy, but enjoyed a healthy afterlife in syndication. NEXT WEEK: JAMES BOND’s Bizarre Influence on Marvel and DC in the ’60s. Click here. Excellent. So when does it all become available on DVD? I had the VHS series, which were enjoyable since some of it was not broadcast in my town. That series made me a Spider-Man fan! Did you know that John Vernon (Dean Wormer from Animal House) was the narrator and voice of Tony Stark in the Iron Man cartoon? And my favorite bit of trivia is that Paul Soles, who was the voice of Hermie the elf who wanted to be a dentist, was also the voice of the Hulk (and Spider-Man). Ed Norton knew this and employed him in the Hulk movie as the old guy who owned the pizza parlor. Those are the little touches I love. Aside from giving a nod to Bill Bixby, Ferrigno and using the Incredible Hulk music,….that is one more reason I think Norton should have been Hulk still. Sorry,….didn’t notice you’d mentioned John Vernon. And I believe you’ve got one of those photos mislabled. It’s Ray Patterson. That’s a name I notice. Where did you get those images of Cap and Namor? I ask because I have that exact Cap image on an animation cel and wonder if it was supposed to be a promotional item or something.